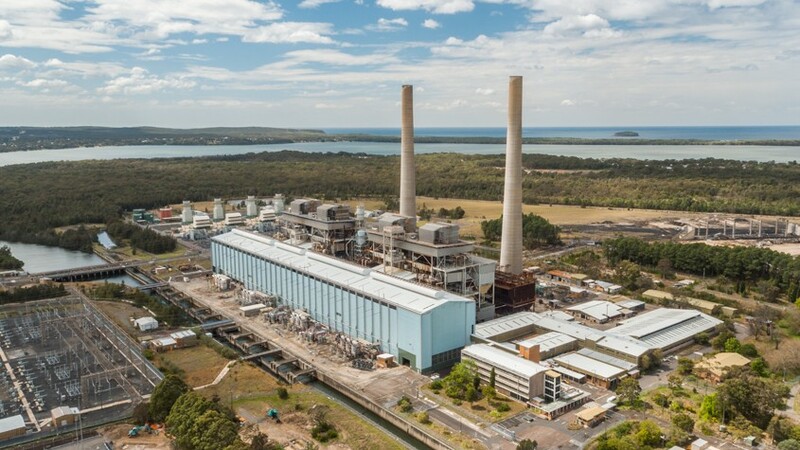 The project involves the removal of a 1400 megawatt coal fired power station including four 350 megawatt steam driven turbo-alternators, two 155 metre high chimney stacks, boiler house, coal handling plant and conveyors and 2.3km of ash lines. 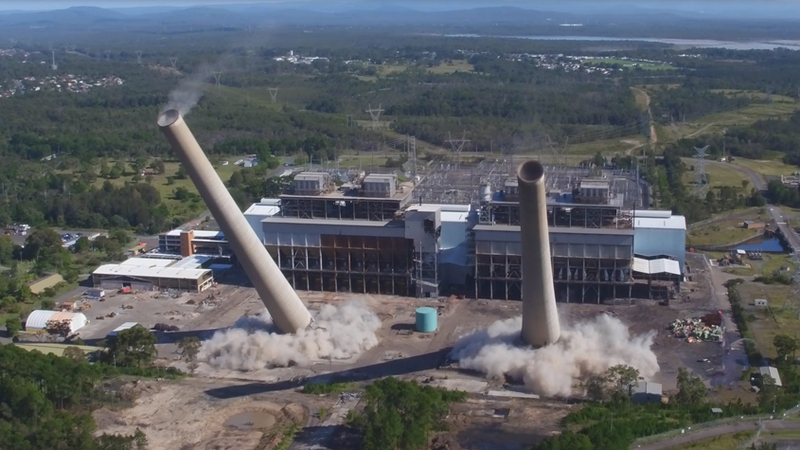 The project is the largest power station demolition project to be carried out in Australia to date. Asbestos removal works have included the removal of large volumes of bonded and friable asbestos. Complicated encapsulation with the use decontamination units for the friable asbestos removal were constructed for the asbestos found within the control rooms of the station. The works were completed within the programmed time frames. More intensive investigations identified numerous areas of asbestos which were not previously identified and were removed in consultation with the client. 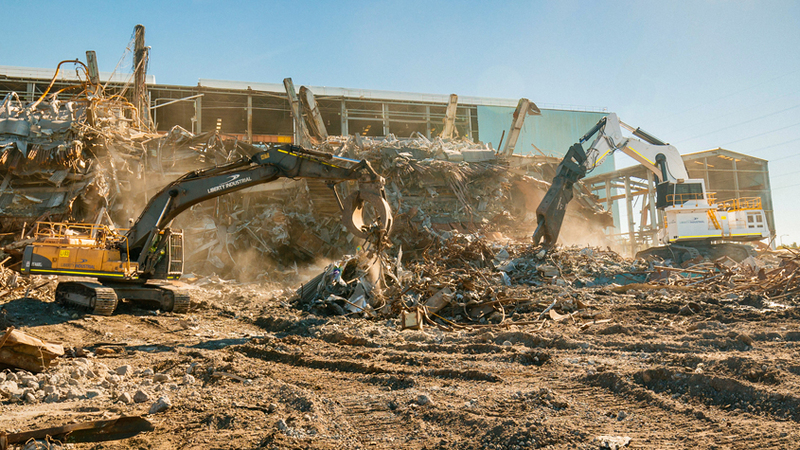 Approximately 30,000 square metres of asbestos has been identified for removal during the demolition, involving the use of Elevated Work Platforms at heights of up to 40 metres. Four turbine generators located within the 270m long turbine hall weighing 1200 tonnes each. During the planning process, it was identified that the two existing 90 tonne gantry cranes located within the turbine house would need to be re-energised and re-certified to assist in the deconstruction works. These cranes have been extensively used to remove rotors weighing 54 tonnes, condenser tube casings, and stators all weighing 50t plus after downsizing. Before any demolition could take place, qualified Asbestos Removal Operatives removed asbestos containing material, at the lower duct openings and the removal of asbestos containing pipework from the top of the stacks using rope access methods. The 155m-tall stacks were demolished using controlled explosive techniques. 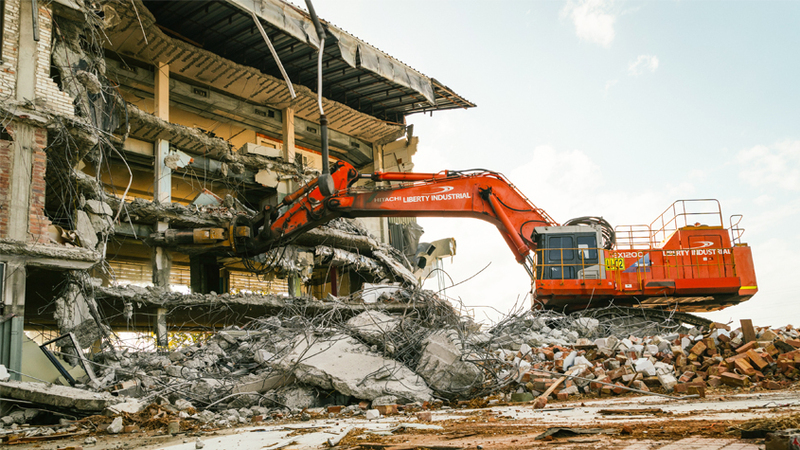 Many months of planning and consultation were undertaken in the lead up to the demolition of the stacks with Liberty Industrial’s project team working closely with SafeWork NSW and a number of government regulatory authorities. A combination hand cutting using standard oxy torches, high flow oxy torches and thermal lances were required to downsize the larger parts of the turbine generator prior to lifting these heavy items to the turbine house floor, and movement to the scrap area for further downsizing. Boilers 1 and 2 were demolished using controlled explosive demolition techniques. Detailed engineering studies identified that the coal hoppers needed to be removed to reduce the force on the structural beams and facilitate the rolling of the structure during the blast. Extensive asbestos removal works were carried out prior to the blast. 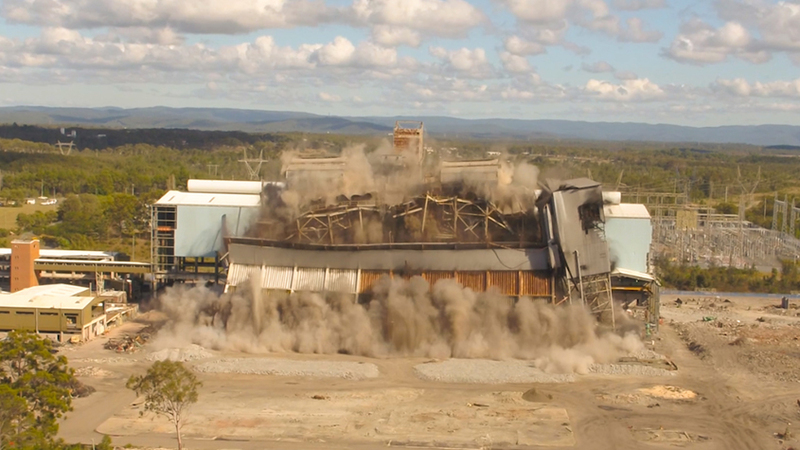 The demolition of the 60 metre high, 23,000 tonne boiler house was achieved utilising an engineered induced collapse technique. The process involves a carefully designed and calculated sequence of structural pre-weakening followed by the detonation of strategically placed explosives charges to collapse the structure in a predetermined direction. The technique was used to safely reduce the structure to a suitable height for mechanical processing. Following the successful demolition of the chimney stacks in March, the blast was the second of three explosive demolition events to be carried out during the course of the power station’s removal. 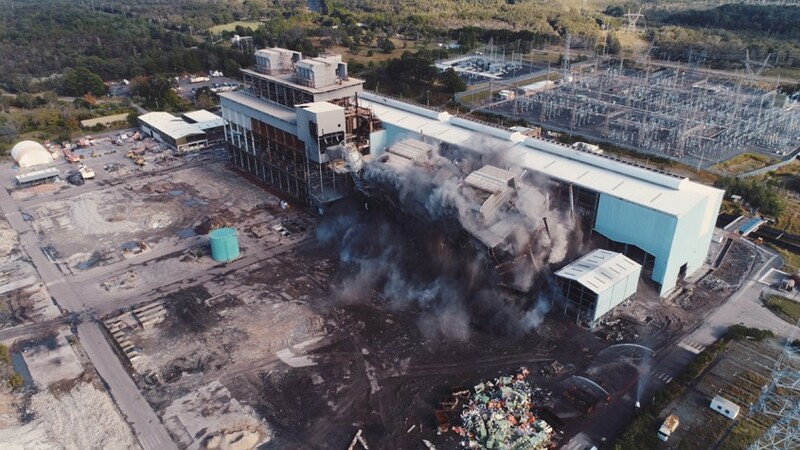 The boilers are the largest demolished in Australia so far. 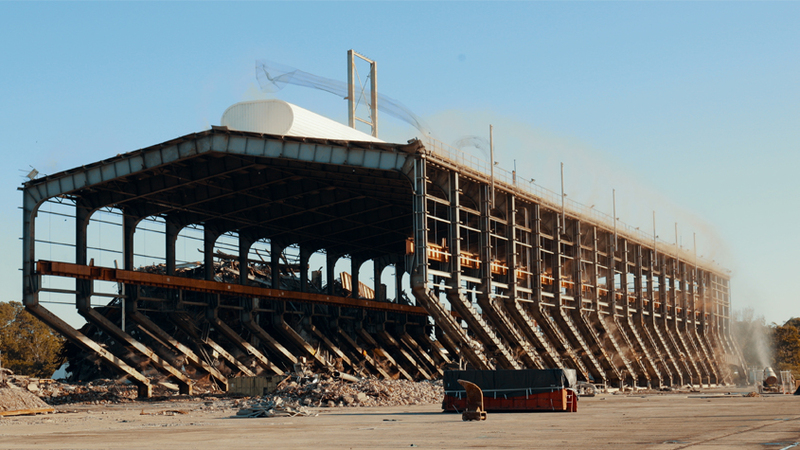 They also represent the largest explosive demolition undertaken anywhere in Australia to date. Weighing in at 23,000 tonnes and 60 metres in height it is the heaviest structure to be demolished using explosives in Australia. Liberty Industrial’s 240 tonne Liebherr 994 complete with the world’s largest shear attachment, the Genesis GXT 2555R in combination with a fleet of smaller excavators with shear attachments have been put to work processing the debris for recycling and shipment off site. Liberty Industrial has full workshop capability on site and constructed a 30m x 20m removable dome shelter for use. A workshop manager and welder are located onsite to maintain an extensive array of equipment including 240t, 120t, 70t, 46t, 38t and 8t excavators and attachments including grabs, magnets, pulverisers, hammers and shears. 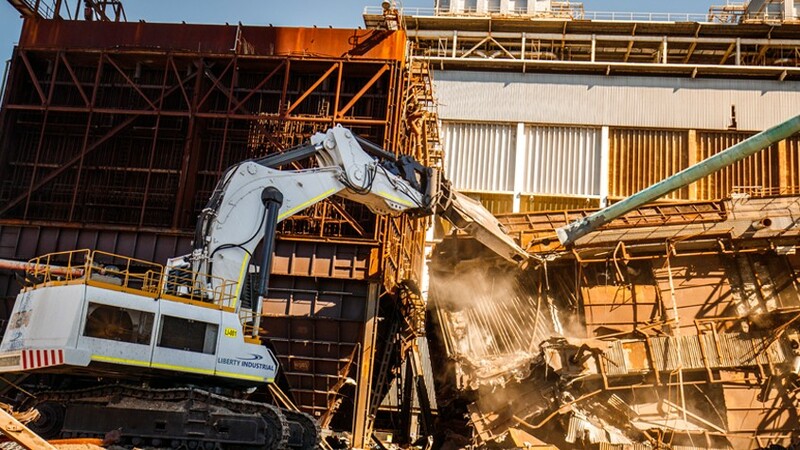 Excellence in environmental management is key to the successful demolition of the Munmorah Power Station which is located between Lake Munmorah and Lake Budgewoi which are connected by two canals that run through the site, and are managed under an Environmental Protection Licence. Stakeholder engagement and management has been an important consideration during the demolition with an operational gas power station, two electrical switch yards, a gas plant and surrounding community. Liberty Industrial is committed to waste reduction and resource recovery with a planned 95% recycling by weight. To date a total of 12 910 tonnes of steel, aluminium and other non-ferrous metals have been recycled. One last explosive demolition event is planned for 2017 with the demolition of the remaining boiler house scheduled for September 2017. The removal of the power station is expected to be completed by September 2018.